See what others have to say about Western Pacific Roofing. Western Pacific Roofing has been our roofing contractor for many years here at Sunrise Country Club. They have been dedicated, professional and provide great customer service and that is what you can expect from Western Pacific Roofing. As an absentee owner I have depended on Western Pacific to maintain the roofing needs of my Palm Springs condo. They have taken great care of it for me. My name is Debbie I am a Realtor with Coldwell Banker. I have consistently used Western Pacific for all of my personal roofing needs as well as for all my client’s needs for the past 14 years. I have found them to be honest in their pricing as well as trustworthy and timely in their job completion. I can honestly and confidently refer them to any client knowing they will take great care of my clients and family. I like that I can make one call and what I need gets done easily and professionally. I will always happily refer Western Pacific Roofing to anyone who asks for a Good roofing company. I had the pleasure of utilizing the services of Western Pacific Roofing at various communities in the Coachella Valley for roofing as well as balcony deck replacement. The work performed is exceptional and on time. They are a true partner in teamwork for the Management Company and ultimately the homeowner. Just wanted to say THANK-YOU!!! 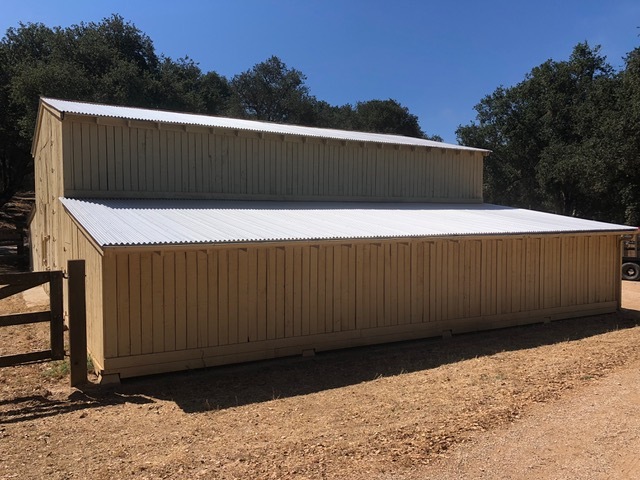 The new Reagan Ranch Hay Barn roof looks fantastic, and I am sure it will help preserve the structure and artifacts for many, many years to come. As usual, you guys are consummate professionals - and the crew was great too! Really couldn’t be more pleased - thanks! I am pleased to send this letter offering my full endorsement of your company and its products and services. I had the pleasure of witnessing the work of your fantastic employees as they replaced a roof on my property. In that time the operated like family. From beginning to the project to the end they did a tremendous job in all aspects of the scope of work required. I was particularly impressed with the clean-up job done once the work was completed…. Thank you for a job well done. I will gladly recommend your services to anyone who is in need of professional roofing work. Just wanted to drop a note and tell you how pleased I was with the whole process of the new roof. When you are spending that type of money it is such a pleasure to have everyone from your company be so helpful. First, Payton and Trevor came out and explained the need for a new roof. That it could not be just fixed. Both were so polite and professional. Trevor gave me some ideas on how to deal with my insurance and took it a step further by suggesting he meet with my adjuster so he could show him the damage. When I went in to make financial arrangements Kim was so nice. She is a real asset to your company. The next several dealings I had with Trevor, he had a lot of patience for someone who knows nothing about roofing. The crew that came out were fantastic. They understood that my big dogs were upset about someone being in their yard and were very good to them. Jorge called and followed through on additional work that needed to be done. The yard was so clean afterward you were hard pressed to know that someone had even come in to do work. My backyard was cleaner than when they first came. They even cleaned out and refilled my dog's baby pool. Each morning Pedro explained what needed to be done and asked my opinion. Never once did any of your staff treat me like I was a "dumb woman" so refreshing. So often all we have is complaints when we do a job, wanted to make sure that you all knew how great you were. It goes without saying I would recommend your company to anyone who will listen. The white roof turned out great. Was kind of wishing for another color, but it looks wonderful. I am glad we had to go with the white now. But nice to know it looks actually better I think than the color I was thinking of. Also how glad I am that rain waited until I was done. All in all, great work guys. Duane and I are so pleased with Pedro and his crew we have enclosed gift cards for each employee. They all worked very hard and were helpful to each other. They created a beautiful roof for our sun room and did an outstanding job on creating custom rain gutters. Outstanding employees. We're so pleased with the foam roofing job that was done... on our home. The attention to detail and the care in which Carlos and his crew preformed the job was stellar. From the total tear off of the existing roof down to the sheathing and the re-roofing it was as if they were working on their own home. Every day the crew was here in the early morning as scheduled, worked tirelessly and cleaned up diligently, never leaving so much as a nail in the yard. We also appreciate the prompt and clear bid, along with further explanations, given by Jeff Martin. And Dawn and Kim in the office were great with the paper work and making sure we always knew what the next steps would be with the project.It's always scary for a homeowner to have work done on their home, but it's particularly frightening when the work is literally razing the roof over your head. Working with Western Pacific throughout the process alleviated any concerns we may have had, and we knew that we made the right choice selecting you as our roofers. We would highly recommend Western Pacific to any homeowner seeking to re-foam their roof. Thank you for making this such a good experience for us. The roof is fantastic. You guys did a great job and I am very satisfied. I would highly recommend Western Pacific Roofing to anyone of my friends! Please tell Pedro and his crew Thank You for my beautiful roof they did a great job! The Postman already told me my roof looks nice. We would like to thank you for our beautiful new roof. We would also like to make sure that you know how we feel about Pedro and his crew. They were not only very professional but efficient with a high attention to detail. Pedro was extremely helpful in pointing out areas that needed special attention and communicating with us during the entire installation process. A very special thank you to all of you at Western Pacific Roofing! We will recommend you to family and friends if they ever need a new roof. We had Western Pacific replace our foam roof about 6 months ago. We obtained several quotes from several other roofing companies and Western Pacific was not only very competitive, but honest about our needs. Everyone we dealt with including Ron, Richard, the superintendent, the office staff and the various other subcontractors, were highly professional, conscientious, responsive and trustworthy. We are extremely happy with the results and a number of our neighbors have told us how good the roof and new fascia board looks. Western Pacific is committed to the highest level of customer service, even months after the project was completed. During the installation process, the swamp cooler on the roof had to be removed and then reinstalled. When we fired it up about 6 months later, we had some minor issues that had to be taken care of. Richard came out immediately to take care of the matter. This level of customer service is rare. We would recommend Western Pacific to any of our family and friends. "We will turn to Western Pacific for any future roofing needs."